ECIL is stand for “Electronics Corporation of India Limited”. This organization is a Public Sector Enterprise under Department of Atomic Energy of India. ECIL Recruitment department is looking for dynamic and result-oriented persons for the following positions on contract basis for a period of ONE year for Junior Technical Officer (Contract) and Six months (extendable by another period of six months depending upon the project requirements) for Jr. Consultant (Field Operation, Gr-I & Gr-II) on contract to work on FLC activities of EVM and VVPAT at Hyderabad and various project sites across the country. 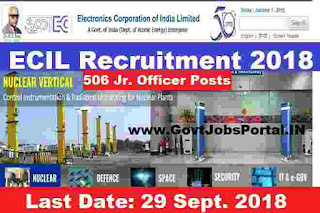 There are total 506 vacancies which are going to be filling up through this ECIL Recruitment 2018. There are various job profile which are going to filling up through this recruitment process. More information about these Government jobs in India is given below in this article. Read the whole article carefully before applying this ECIL Recruitment 2018. For the Post of Jr. Technical Officers: Those who have B.E. / B.Tech degree in the stream of Electronics / Mechanical/ Electronics & Instrumentation/ Electrical & Electronics and Computer Science. Must have age less than 28 years for applying Jr. Technical officer posts. For the Post of Jr. Consultant Field Operation (Gr-I): Those who have 3-year full time Diploma in any stream with at least 60% aggregate marks. Must have age less than 25 years for applying this job profile. 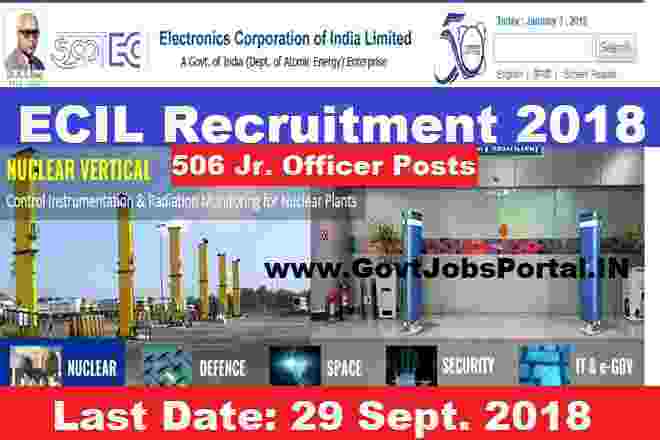 What is the Application Fee for applying these ECIL Recruitment 2018? All eligible applicants from India can apply for these Government jobs in India by paying ZERO application fee. All applicants can apply without paying the application fee. 21ST Sept. 2018 is the Opening Date to Apply.